“A fire lit up inside me one day when the silverback who was the pride of Kahuzi-Biega National Park was shot in 1993. The murderer was brought to justice, but two hours after we saw him walking around and laughing at us. 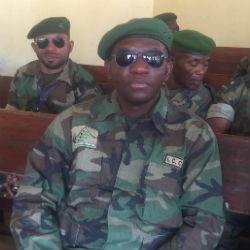 At that time I was in charge of awareness where I was trying to show people the importance of preserving nature in general, especially the gorillas”, says Radar Nishuli, Director at ICCN in the Democratic Republic of Congo (DRC). “My motivation became even greater in 2008, when I suddenly realised the shameful injustice with which the authorities were treating cases of park rangers or gorillas killed by poachers, in comparison to other crimes," Radar adds. "When an ordinary man is injured or killed, every authority and NGO gets up to shout about it, brandishing human rights, but when a poor park ranger or a gorilla is killed, no-one dared to speak about it out loud. It was then I realised I had a mission in life – to become the defender of wildlife and park rangers’ rights. And the only way to do this was to document these cases, to denounce them, and to develop mechanisms for preventing these injustices." The ICCN is responsible for conserving the natural heritage of DRC, including the protected national parks and endangered gorillas. 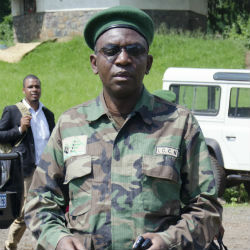 Radar is an international expert and specilaist in protected area management. Radar is currently writing a book about his 35-year career, including the highs and lows, in order to share his experiences with young conservationists and ensure the struggles endured, and overcome, are not forgotten. 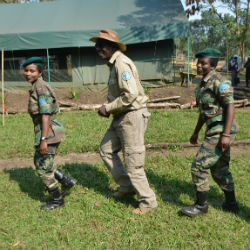 Training junior rangers, including women, is vital to Radar as they are the future of nature conservation and will continue his work. Working in DRC is not without difficulties, with guards risking their lives on a regular basis. A typical day in the field patrolling the park, gorillas and other species, requires essential planning, preparation and discretion. Details of the mission are only given out a few hours before as caution is required in all things they do.